Emergency food preparedness is one category of food security but it’s hardly a new concept. Biblically, the concept of storing up for disaster is presented early in Genesis when there was a prophesy of 7 years of plenty in the land followed by 7 years of famine. Joseph had stored up food and was prepared when the supply ran out for others. 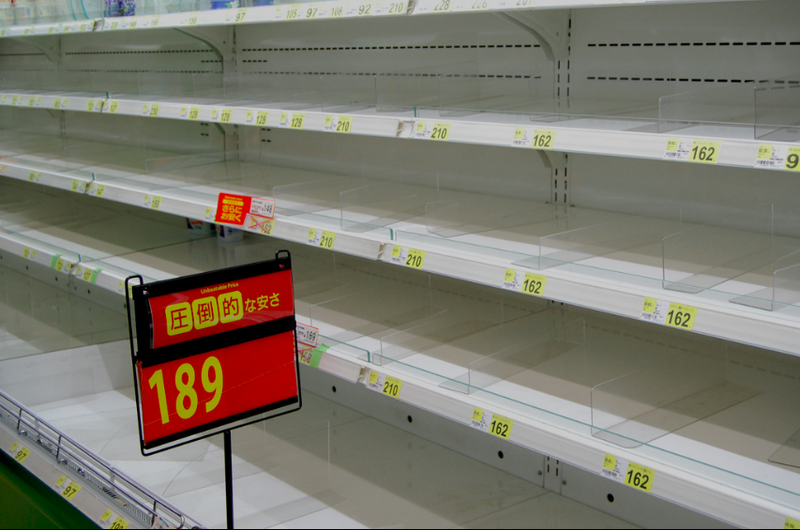 Certain faith traditions continue a similar practice of food sufficiency and these are deemed critical as grocery stores maintain about an average 72 hour supply of food which is easily disrupted when transportation isn’t available. While disaster preparedness extends far beyond food, there are some key items that we might consider as a project for 2014. 1. Know the food requirements of your household. Although the notion of my husband or I eating less is a welcome thought, my boys have extreme caloric requirements without body fat to get them through a lean time. The average adult male requires 2,300 calories each day. Women and children are typically less than that amount and everyone has an increased need if they are involved in physical labor. 2. Purchase ingredients rather than prepared foods. Ingredients such as salt, legumes, oatmeal and wheat last much longer than prepared foods like frozen dinners, cereal and food mix. Just remember to be practical. For example, if your pantry contains a large supply of wheat berries, what is your plan for actually using them? 3. Do you have water storage? Staying hydrated can be a lot more important than eating and if you’re storing things like legumes and rices, you’ll need water for cooking. If your water supply is compromised in a disaster, you’ll want to avoid salty foods or those that are high in fat as they’ll increase your water requirements. 4. Always store food in appropriate food storage containers. Make sure that these containers will stand up in hot and cold temperature extremes. Be cautious of plastic bags or products that will leach into the food. 5. Make sure you have the right tools available. If you have to eat without gas or electricity, are you able to? Have a hand crank can opener in a place known to you. 6. Use your food storage so that you are keeping it fresh. If you’re familiar with accounting principles, use a FIFO (first in, first out) method so that cans in the back of the cupboard get used first. 7. Have a garden and know what other landscaping or wild plants might be edible. In our yard we have mesquite beans for flour, nopales (cactus pads) and prickly pear fruit. While not available all the time, when in season, they’re abundant. 8. Learn a lesson from Old Mother Hubbard. When you’re making a plan for your household, don’t forget to consider the needs of your pets although many of them are undoubtedly better foragers than their owners. 9. Check your stash of herbs and spices. It’s much easier to create variety in a regular diet of beans and rice when there are spice options. 10. Look in on others who may not be as able or as prepared. There is likely an elderly, infirm or just ill prepared neighbor within your reach. Apply the golden rule. The internet and library are rich with sources on emergency preparedness. The resources range from pragmatic check lists to tomes of survivalist tactics. If this is something that you’ve thought about, you’re ahead of most of us so this list is intended to create consideration for a basic plan that is unique to you and your needs. Are you prepared for a food emergency? This happened to us twice recently, after a tornado when we were without electricity and the ability to drive to a store, and recently during the cold and snow storm. When I went to the store after a few days, they were completely out of many staple items. Thanks, Tammy , for helping us think about things like this! The 72 hour packs are really a good idea if you live in an area that is impacted by weather. There are some terrific resources available with as many tips as you want. See the links. Excellent tips, Tammy. We set up an emergency pantry after the derecho of 2012 – all the grocery stores within a 10 mile radius around us looked like the photo above. As you mention, given the frequency of various types of disasters (natural and otherwise), every household would do well to have a backup plan. I don’t have a plan despite having a well-stocked pantry. These are lessons that I need to learn myself. Good one Tammy. We should be cooking that way anyway, right? Every year, before Hurricane Season, we stock up on food that can be served with minimal preparation ~ nuts, peanut butter, crackers, etc. Every year, when November arrives, we breathe a sigh of relief. That’s a good plan Nancy. I have a healthy larder but am going to try to be more intentional about it. I think another item to note would be familiar with certain skills like fishing, hunting, and basic shelter making. So much rely on grocery stores for our food that basic skills are forgotten. Those are both good items for the survivalist list – I am hoping that I never have to exercise my hunting skills! Water is going to be my first focus Tandy. We don’t have enough on hand. Oh my! I am 100% UNPREPARED. Something to think about! Start with water Diane but do some reading on a 72 hour pack that I hope you’ll never need. Great reminder, Tammy! We lack the most important item: fresh water. Ever since we changed over to drinking from the water cooler, I have been lax about having a fresh water source for emergencies. Your timing is great with the food. I am actually starting to experiment with backpacking meals for the hikers in our family. Having the dehydrated meals ready will also be a great emergency food source. Dehydrated meals are a good option. Although it goes deeper than I ever hope I have to, the survivalist mom link has some great tips. It’s smart to at least be somewhat prepared. Years ago, I went with my Mormon friend to food storage classes at her church. I learned so much. They try to keep 1 year’s worth of supplies (food, toiletries, diapers, toilet paper, etc…) in case of emergencies. One of the classes was focused on 72 Hour Bags. We put together 3 days worth of food and drinks for 1 person in a gallon Ziploc bag and put together a bag for each person in our family. I keep the 72 Hour Bags in a backpack (with toiletries, toilet paper, flashlights, radio, batteries, meds, etc…) that I can just grab and throw in the car if we ever have to evacuate quickly. It is easy to Google menus and ideas for the bags. I change out the bags with new ones every 6 months. I just give the old ones to the kids and they can snack on the items. Nothing goes to waste. That’s great! Yes, the LDS church recommends that it’s members have a year’s supply. That’s a lot but they actually have services and schedules that assist. The 72 hour pack is a great place to start. Hi Tammy, I really don’t like to think about this—but your point is well-made. Recent years have seen an increase in unforeseen disasters and we’d be wise to make some preparations. And, remember our neighbors. I’m with you Nancy. I also don’t like to think about it but when I do, I realize I’d be unprepared. This caused me to read up on some stuff that I probably need to do. Good for you Lucy! You’re ahead of the masses and I think it’s a really good idea – especially where you live. Excellent post. These are good tips. Now to get to work to implement them. One step at a time. I’m doing Water first. Good for you Sophie! Many of us here are unprepared. Not totally prepared, but I am on the road to being fully prepared. I have grains in storage bins that should keep for years. I am working on the water part – hoping to purchase a water tank to catch/store rain water. I do have lots of propane (from camping backpacking) and the stove(s) to cook on. I did invest in a food grain mill (non-electric) just for the purpose of “being prepared.” Great post Tammy! thank you. I would also like to learn more about rain water harvesting. Whoever does it first has to post about it, okay? Canning is a great still to combat this Inger. I need to work on the water. I had never experienced power outages longer than about a day until we moved here. With the derecho in 2012 we were without power for 4 days. Eye opening! We even hosted friends for dinner while off the grid, though, since we couldn’t reach them to tell them we were in the dark. The grill served as a great way to fix the food thawing in the fridge, and enjoying games around the table by candlelight made it kinda fun. Adding this to my 2014 To Do list–thanks! The post has caused me to think a lot also Kirsten. Our grill is piped gas and it’s likely that it could be affected in a real disaster. Maybe a pack of charcoal in the garage for lean times? I am putting it on my to-do list also. Wow. It took me a moment to realize that you live in an area where you have to be prepared for natural disasters like tornados. Here in Europe it’s so quiet, so that emergency preparation in the way you describe it isn’t usual. I found it very interesting to read though and will keep your recommendations in mind. Who knows, one day I’ll need them. I think the water recommendation is a good place to start Kath. If our water supply was cut off, I wouldn’t have enough for my family and my pets. I like your tips a lot, especially #10. I’ve hardly ever seen ‘helping other people who are less prepared’ mentioned in other places. In all our preparedness research and activities, that is something that has been weighing on our minds – being able to help somebody else in a hardship situation. Inevitably there will be others who are unprepared or unable to help themselves – even without a disaster! With all the disasters happening here and there and everywhere. This post is very timely and very well done! Thanks Linda. Love your new gravatar! it is always a good reminder to think about food storage when a disaster can happen at a moments notice. It’s a bit scary to consider but also really pragmatic. Are you prepared? Wonderful advice! We aren’t prepared for an emergency like that and I really do need to make some preparations. Excellent preparations, Tammy. We were happy to install gas in our kitchen when we renovated a few years ago, which has helped out more than once during electricity outages. And it’s fun to cook with, eh? How good of you to write about this, Tammy. As a Pod Leader (Emergency Program), I remind my (5) Neighbourhoods periodically to check their Emergency Preparedness Kits in home and car. We need to change the water periodically and look at expiry dates of canned goods. ( Is the can opener still there? ) I link neighbours to sites where suggestions are made for the type of foods to have in stock – and in the emergency kits. And remind them not to forget pets. These sites have helpful hints like freezing ziploc bags of drinking water. Or putting together a family plan about how/where to meet if an emergency hits when everyone’s away from home. And hopefully all family members know how to turn off gas appliances, etc. We know the neighbours who have especially critical tools, equipment or machinery. Since they’ve told us, they know it will be shared. However, family first…then neighbours. I have the great good fortune of having 3 Ham Operators in my Pod. When all else fails, Hams get through. Now…may we never have to use any of this, Tammy! I sure hope we don’t. You know Amy, I worry more about areas like yours than I do about my own. My mother in law is on Harstine Island and it seems that so many of the neighbors are single women and some are getting up in years. I’m happy to know that people like you organize to take care of each other. Great tip about the neighbors! I periodically seem to need some degree of something from emergency supplies (water recently due to the Arctic Vortex original version; that deretio storm in 2012; gas explosion on my street when I lived in Boston; snowstorms etc). I do make an effort to keep basics in stock for 5 or so days, but I also do not keep enough water as I generally only have about 3 or 4 gallons for me + large dog. Tip for storms you know are coming: fill the bathtub for flushing. It’s also important to keep medications on hand (I detest the refill policies that make it hard to keep a two week supply on hand) and plan for extra food supplies for those with dietary restrictions that may not be able to eat MREs etc brought in by disaster assistance. medications is a good add! and I’m sure you’re right that there are some crazy policies preventing it from happening efficiently. Solar cookers might be a nice option for people who live in places where there is reliable sun, too. Solar cookers are a good alternative here. I’m focusing on water for the moment though. Discreet tasks in discreet steps. and, I think you’ve been through enough to last you quite a while! Great tips, there. I need to take some of your advice, in case of a zombie apocalypse! Zombies, yep. That’s probably the most pressing issue in my house. If you’ve hit the trails in the last decade or so, you’re probably already familiar with backpacking meals. There are hundreds of different dishes available, from main entrees, vegetable and starch sides to deserts and breakfasts. Unlike MRE’s that contain several types of food in each unit, these backpacking meals have only one dish per pouch and they need to be prepared with hot water. On the other hand, freeze-drying means better tasting food. If you don’t want to agonize over choices, buy one of the assortments. My favorite freeze-dried food company, Mountain House, makes a great variety of food pouches that are sold by distributors in a range of kit sizes, from a compact 72-hour size to a 90-day supply. Buy a month’s worth and you’ll have a first-rate supply of portable survival food for a small group. In our hall closet we have backpacks for each person – in the kids we have cross word and word searches, and some non-electronic games, small blanets and non-perishable snacks. We all have flashlights, batteries, two bottles of water small first aid kits. Never had to use them. It was just something my mom use to do for when the power went out as it often did as a kid. My garage cupboard has water, Peanut butter, dry ceral, tuna, beans, fruit snacks, and a couple things I am sure I am forgetting. Thanks for the reminder I am overdue to check my supplies. It should go on the calendar as an action item every 3-6 months Kathy. I learned a lot by reading about this. It is almost very important thing to have emergency food all the time with you whenever you are in travel or better option to take emergency food from from store to be safe wherever you are. When i suppose to go for some travel with my family.I never take chance of with family’s life..I always make sure that we take MRE with us…some time we make it ourselves..otherwise we ordered it from https://www.hikingware.com/product-category/mresmeals-ready-to-eat/….